We wheel the Poison Spider Mesa trail with: Moab Outfitters, Notch Customs, Prime 4×4, and the Fallen Heroes Jeep. Got a garage full of 4×4 parts you’d like to turn into cash? Or maybe you have cash you’d like to turn into a garage full of parts? Either way, we’ve got a solution! 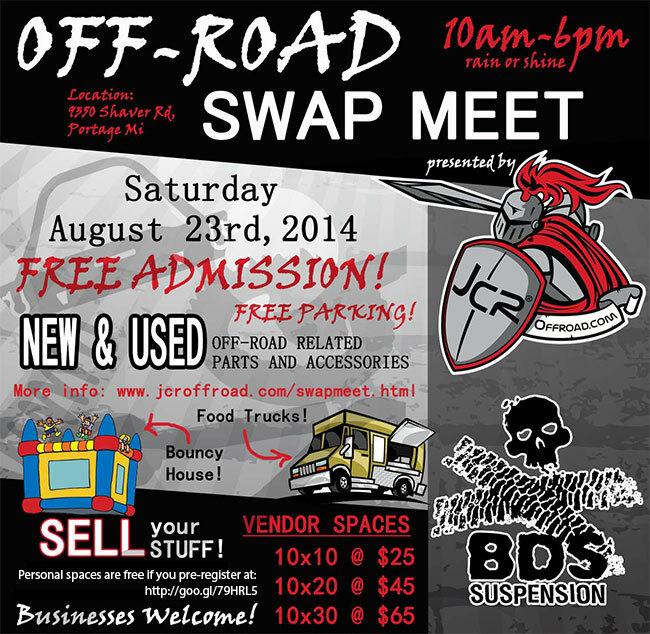 JcrOffroad and BDS Suspenion are hosting the 1st annual Off-Road Swap Meet on August 23rd 2014. To sell your stuff, reserve your booth space today; to buy, just show up! Admission is free, plus we’ll have some local food trucks and a bounce house for the kids. JCR and BDS will also be selling all sorts of used and scratch and dent product, plus we might even have some show specials going on as well. Vendor space is limited, so sign up ASAP. Hope to see you there!